Premier League: What are the top questions asked about your club? What are fans searching for about your club? What are the most common questions other football fans ask about your club? 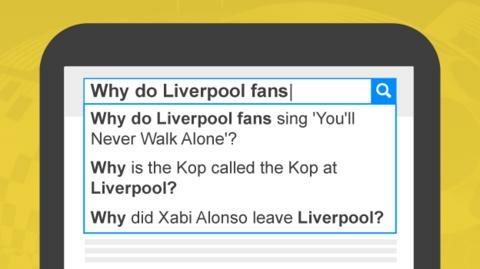 BBC Sport has compiled the most searched for 'why' questions in the UK for Premier League clubs from the start of the season. Queries about black armbands are most popular, with 11 clubs featuring a question about the subject in their top five searches. Sixteen of the 20 clubs had questions about their nicknames. Some of the top-five questions may surprise you, the answers (most of them) can be found in the links. 1.Why are Arsenal wearing black armbands? 2.Why do Arsenal have so many injuries? 3.Why didn't Arsenal sign anyone? Manager Arsene Wenger did not see a player he could "guarantee making the team better"? He did not see it? Classic Wenger. 4.Why are Arsenal called Arsenal? 5.Why are Arsenal called the Gunners? 1.Why are Aston Villa doing so badly? 2.Why does Prince William support Aston Villa? Prince William didn't want to be a glory hunter by choosing a club like Manchester United or Chelsea. He chose Villa, who are now bottom of the league. That went well. 3.Why is the Villa v Man United match on a Friday? 4.Why are Aston Villa called Aston Villa? 5.Why aren't Aston Villa in the Uefa Champions League? 1.Why are Bournemouth called the Cherries? Slight contention about this one. The players wore cherry red coloured striped shirts and the stadium Dean Court was built next to an estate which included many cherry orchards. 2.Why are Bournemouth wearing black armbands? 3.Why aren't Bournemouth playing Tyrone Mings? 4.Why should the Bournemouth goal be disallowed? 5.Why is the Bournemouth ground called Vitality? Was a cherry orchard the reason behind Bournemouth's nickname? 1.Why are Chelsea doing so badly? A whole host of reasons. Too much time off in the summer, poor transfers, the Dr Eva Carneiro controversy and attitude of the players are just some to mention. 2.Why are Chelsea wearing black armbands today? 3.Why did Petr Cech leave Chelsea? 4.Why did Jose Mourinho leave Chelsea? 5.Why did Arjen Robben leave Chelsea? 1.Why are Crystal Palace called the Eagles? 2.Why are Crystal Palace called Crystal Palace? 3.Why was Dwight Gayle sent off? 4.Why do Crystal Palace fans hate Ashley Young? 5.Why do Crystal Palace supporters wear black? To give an appearance of being sinister and a powerful image of unity. It gives them the appearance of an army and the strength as a gang. Basically, to make them look hard. 1.Why are Everton called the Toffees? 2.Why are Everton wearing black armbands? 3.Why do Everton play the Z Cars theme? One of the cast was an Everton fan and took others from the show to watch the team. In recognition, the players came out on the field to the music and it stuck ever since. 4.Why are Everton called Everton? 5.Why did Gary Speed leave Everton? What prompted Everton to adopt the theme tune to police drama Z Cars? 1.Why are Leicester City called the Foxes? 2.Why did Leicester sack Nigel Pearson? 3.Why are Leicester City doing so well? A passionate manager in Claudio Ranieri, a team-ethic with a great atmosphere, livewire striker Jamie Vardy and work done by previous boss Nigel Pearson. Leicester's fairytale continues. 4.Why are Leicester fans booing Harry Kane? 5.Why isn't Jamie Vardy playing? Is fox hunting behind Leicester's nickname? 1.Why did Xabi Alonso leave Liverpool? 2.Why are Liverpool wearing black armbands? 3.Why are Liverpool so bad? 4.Why is the Kop called the Kop at Liverpool? 5.Why do Liverpool fans sing 'You'll Never Walk Alone'? The version the fans sing was released in 1963 by Liverpool group Gerry and the Pacemakers and was adopted by the Kop not long after. Hold up those scarves..."When you walk, through a storm..."
Arguably the most sung song in football, but why do Liverpool fans sing You'll Never Walk Alone? 1.Why do Man City fans boo the Champions League anthem? 2.Why do Man City fans boo Alvaro Negredo? 3.Why are Man City fans called Berties? 4.Why do Man City have three stars above their badge? The three stars above the eagle constitute a design element that gives a more continental feel to the badge. Purely decorative. Maybe Pep Guardiola can deliver three European Cups to give it a different meaning? Although from next season they'll wear a more traditional version of the badge. 5.Why did Peter Schmeichel join Man City? Welcome to Manchester - Peter Schmeichel crossed the divide in Manchester, but why? 1.Why are Man United wearing black armbands? 2.Why do Leeds hate Man United? 3.Why did Angel di Maria leave Manchester United? 4.Why did United let Paul Pogba leave? Pogba, then 19, departed the club in 2012 after refusing the offer of a new contract because he had grown frustrated by a lack of first-team football. Oh, how they must regret doing that. 5.Why are Manchester United so bad? 1.Why do Newcastle fans clap on the 17th minute? 2.Why are Newcastle called the Toon? 3.Why did Alan Pardew leave Newcastle? 4.Why do Newcastle have seahorses on their badge? The two sea-horses represent Tyneside's strong connection with the sea. Maybe it should have been an anchor, to stop them sinking into the Championship? 5.Why did Newcastle get rid of Remy Cabella? An iconic badge in English football, but what do the two Newcastle seahorses signify? 1.Why are Norwich called the Canaries? It comes from The Strangers, who were European refugees who came to live in Norwich in the 16th Century. They were famous for breeding canaries. 2.Why is Lewis Grabban suspended? 3.Why is Norwich wearing black armbands? 4.Why did Norwich sell Bradley Johnson? 5.Why did Alan Bowkett leave Norwich? 1.Why are Southampton called the Saints? "Oh when the Saints, go marching in..." Since its inception in 1885, the club have been called the Saints because of its history as a church football team. Since 2001 St Mary's has been the home of the club. 2.Why were Southampton wearing black armbands? 3.Why does the Arsenal v Southampton game kick off at 7.45pm? 4.Why was Alan Pardew sacked by Southampton? 5.Why did Cedric Soares come off at half-time? 1.Why do Stoke fans boo Aaron Ramsey? In 2010, the Welshman suffered a career-threatening leg break following a tackle from Stoke defender Ryan Shawcross. Ramsey was claimed to have turned down an offer of apology from Shawcross and has been given stick at the Britannia Stadium ever since. 2.Why do Stoke fans sing 'Delilah'? Nobody seems to really know, but the most popular theory is that it began in a pub after a policeman asked Stoke fans to sing without swearing. Fantastic. 3.Why did Tony Pulis leave Stoke? 4.Why has Xherdan Shaqiri joined Stoke? 5.Why are Stoke fans booing Nacho Monreal? 1.Why are Sunderland called the Black Cats? 2.Why did Jordan Henderson leave Sunderland? 3.Why do Sunderland A.F.C fans hate Jimmy Hill? When chairman of Coventry, Hill had their kick-off against Bristol City delayed on the final day of the season. News came through that Sunderland had lost, meaning both the other teams would stay up if neither scored. Ouch. 4.Why do Sunderland fans hate James McClean? 5.Why is Seb Larsson not playing? 1.Why are Cardiff and Swansea in the English league? 2.Why did Michu leave Swansea? 3.Why do only some of the Swansea players have black armbands on? 4.Why are Swansea City fans called Jacks? Two theories here: the reputation of local seamen "Jack Tars" in the early 19th century and a dog named Jack who rescued 27 people from drowning in the River Tawe and Swansea Docks during the 1930s. 5.Why have Swansea City changed their strip from black and white? Why did Michu leave, and where did he go? 1.Why are Tottenham called Hotspur? Founders of the club wanted to see their team emulating the prowess of noble Sir Henry Percy, whose nickname was Hotspur. The club are showing their fight for a first Premier League crown this year. 2.Why are Tottenham wearing black armbands? 3.Why is Andros Townsend not playing for Spurs? 4.Why do West Ham hate Spurs? 5.Why are Spurs called Lilywhites? 1.Why are Watford called the Hornets? 2.Why do the Watford football team come out to the Z Cars theme? 3.Why do Watford have a moose on their badge? This one isn't what a lot of people think. It is actually the head of a hart, the symbol of the county of Hertfordshire, and not a stag or moose, as many often see. 4.Why is Victor Ibarbo not playing in Watford? 5.Why don't Watford buy English players? 1.Why are West Brom called the Baggies? The baggy clothing worn by people in the local ironworks who went straight to the match after work or the gatekeepers gathering takings at the ground in large cloth bags. Which one? You decide. 2.Why do West Brom sing Psalm 23? 3.Why are West Brom wearing black armbands? 4.Why did Bojan have to be held back from Tony Pulis? 5.Why doesn't James McClean wear a poppy? What exactly got Bojan and Tony Pulis (right) so riled this season? 1.Why do West Ham fans sing 'I'm Forever Blowing Bubbles'? Adopted in the 1920s by former manager Charlie Paynter and many years later featuring in the Green Street Hooligans film. 2.Why do Millwall hate West Ham? 3.Why are West Ham called the Hammers/the Irons? 5.Why has Kevin Nolan left West Ham?